Electricity - what is it and how does it work? What is electricity and how does it work? Electricity is the movement of sub-atomic particles called electrons. A concentration of electrons in one place makes an electric charge, you can measure how strong the electric charge is by measuring its voltage. Electrons will move through some materials easily, these are called conductors. In order to keep the electrons contained in a conductor, it is surrounded by an insulator. An electric wire, made from a conductive core (usually copper) and an insulating sheath (usually plastic) can move electric charge from one place to another. We can count the number of electrons moving past a point in the wire and this is called current which is measured in amps. Electric charge does not spontaneously gather itself in one place, in order to do this we have to work to push the electrons together. This is what we do to produce electricity, usually we use a magnet to push the electrons through a wire in a machine called a generator. 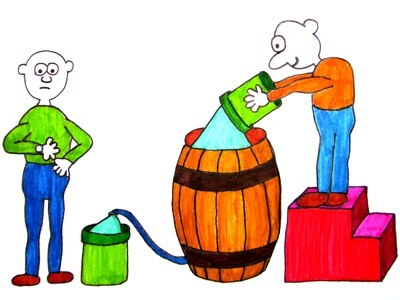 To use an analogy we can think of a pipe connected to the bottom of a barrel. If we put water in the barrel it will flow along the pipe. The water is like the electrons moving through a conductor pipe. If we put a lot of water in the barrel and fill it up to the top the water will flow more quickly through the pipe, this is because there is a larger pressure from the weight of water pushing down in the barrel. This pressure is analogous to voltage: higher pressure means more water pushed through the pipe, higher voltage means more electrons pushed through the conductor. We could see how much water was coming out of the pipe by filling buckets. The buckets fill more quickly if the flow is faster, the flow rate is analogous to current (amps). In order to keep the water flowing the barrel needs to be constantly refilled, it requires work to lift water filled buckets and tip them into the top of the barrel … just like the work needed to generate electricity. Our barrel is acting like a battery, maintaining the water flow even after we stop filling it. A bigger barrel holds more water just as a bigger battery holds more electrons. Water flows slowly through a small pipe, we can speed it up (more current) by either increasing the pressure (higher voltage) or making the pipe diameter larger. We see exactly the same characteristic in the electrical system a thin wire only allows a small current to flow because it has resistance (electrical resistance is measured in ohms). A thicker wire has less resistance and will allow more current to flow just as a large pipe allows more water to flow. The water analogy breaks down slightly because water travels through air, but electricity does not. In a real electrical system there must be a return path allowing the electrons to move from where there are excess electrons (negative) to where the electrons are missing (positive). This electrical loop is called a circuit. 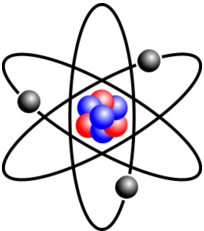 Referring back to the image of an atom at the top of the page; electrons which carry a negative charge orbit a core made from neutrons (no charge) and protons which are positively charged. Usually, the number of electrons balance the number of protons and any charge is cancelled out. Electrons can be moved, but protons can not, if an atom has missing electrons (holes) it will no longer be in balance and will have a nett positive charge. While conventionally current is shown flowing from positive-to-negative, in reality electrons physically move from the negative pole where there are too many to fill the holes at the positive pole. tracks centre-left, delaying the signal by 0.00000000002 second. Electrons move slowly, depending on current and conductor cross section, usually much less than a millimetre per second, but all the electrons move together round a circuit where one influences the next which influences the next, etc. In this respect it is similar to a water filled pipe, pumping more water in at one end pushes the water already in the pipe along to emerge at the other end. The propagation effect from one electron to the next travels very quickly indeed, at near the speed of light. Electricity takes 1 nanosecond to travel 1 foot, a weird measure but easily memorable (there are a thousand million nanoseconds in a second). Modern computers operate so fast they have to take into account this propagation delay, the traces on a printed circuit board often form intricate zigzag paths to ensure all the signals arrive at the correct time. Mains electricity is called 'alternating current' (AC) because the direction of travel of the electrons is constantly being flipped back and forth, in Europe this happens 50 times a second. There is a good reason for this as the electrical generators are large rotating machines called alternators. During one half of each rotation they push elections one way round the circuit and during the other half they push them the other way, thus creating a positive voltage followed by a negative voltage. Imagine transmitting 1kW over a wire with 2 ohms resistance. If we use 100V we will need a current of 10amps, since Power = Voltage x Current. However, there is a loss associated with the 2ohm resistance of the wire. Ohms law (Voltage drop = Current x Resistance) allows us to calculate that the voltage drop which will be 10 x 2 = 20 volts. We started with 100V but lost 20V on route which means we only have 80V x 10A = 800W of the power left, so 20% is 'lost' during transmission. Sending the same power using 1000V only needs a current of 1A. The lower current means we have a lower voltage drop of only 2V (1amp x 2ohms). This is a double win as we have lost less voltage, despite having more in the first place. We started with 1000V but only lost 2V on route which means we have 998V x 1A = 998W of the power left, so only 0.2% is 'lost' during transmission. By using ten times the voltage we reduced the power loss to a hundredth of the previous level! There are other losses associated with conversion and transmission at high voltage, but as can be seen from the little example the potential efficiency gains are huge. This is why the UK national grid uses 400,000V for the main backbone of the distrubution system. A battery stores energy chemically and releases it as direct current or DC. Since mains electricity is AC we need a way to convert DC to AC, this device is called an inverter. Before solid state electronics this was done by connecting a DC motor to the battery and using it to drive an alternator, but it is now done with high power semiconductors.